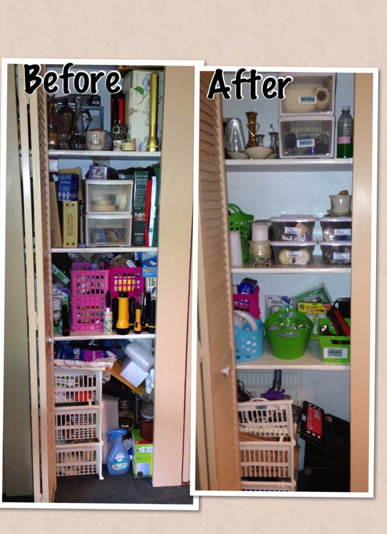 Everyone has a pantry in the kitchen that they store a lot of commonly used items in. For my house, it's flashlights, lightbulbs, candles, vases, and a few other odds and ends. Since these are all important items I had to make them easily organized so that they would be easy to find and grab in a hurry. First I separated the items into groups: batteries, tapes, string, light bulbs, candles, flashlights, vases, odds and ends, etc. Then I found containers big enough for each grouping. And finally, I had to find a way to put them on convenient shelves. I grouped items together. Vases and string aren't used as often so they went on the top shelf. The candles went on the next shelf, placed in plastic shoe boxes, with the large candles out by themselves. And on the next shelf went light bulbs. I even stored lightbulbs delicately in a little oval bin so that they can't get banged around and broken!! Look at how nice and neat that looks! Looks much better! I'd love for you to share this at my link party "Organize My Life" that opens every Monday night. Stop on by http://maryorganizes.com! Have a great day!